You are met and assisted by our representative at the airport. Transferred to the hotel for an overnight stay. Morning sightseeing of New Delhi including Government buildings, India Gate and Laxmi Narayan (Birla) Temple. In the afternoon visit Qutb Minar, Humayun's Tomb and Raj Ghat. Overnight stay in a hotel in Delhi. This morning, travel to Chandigarh by an Express train . After a brief city tour we drive to Pinjore and then continue to Shimla for two night stay. Included guided walk around Mall and central Simla, followed by time at leisure. One may make a visit to nearby temples , Church or the Museum. Transfer by road to Manali . Evening at leisure . Overnight stay in Manali for three nights. Morning visit to Manali, to include Hadimba Dcvi Temple and sulphur springs at Vashisht. Evening is free to explore the local market area. Visit the local sights including the sobha Singh's art gallery , a monastery , pottery institute and the tea estates. Drive to Dharamsala (McLeodganj) for sightseeing and lunch. 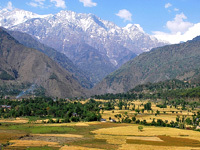 Dharamsala, current home of the Dalai Lame, is set along a spur of the Dhauladhar range, overlooking the Kangra Valley and the Shiwalik mountains. Visit the headquarters of H.H. The Dalai Lama in Mcleodganj and the Norbulingka Institute, centre for Buddhist teaching, housing over a thousand painted images. You can also visit the Namgyal Monastery, the Kalachakra Temple and the Bhagsunath Temple. Paintings by Roerich can be seen in the Museum of Kangra Art. In the afternoon continue to Pragpur for 2 nights at the Judges Court Hotel. Judges Court, a heritage property where you enjoy traditional hospitality of the royal family. Pragpur is a medieval "heritage" village with cobblestone streets and slate-roofed houses. At leisure to explore the village. Proceed to the delightful Nalagarh Fort, another heritage resort offering very warm local hospitality, for 2 nights. 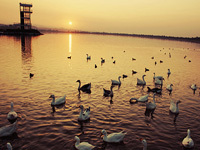 The fort commands beautiful views of forests and orchards and the area is rich in birdlife. Drive to Chandigarh in the morning. The planned city was designed by Le Corbusier and is built in various sectors, with the Sukhna Lake and the Rock Garden being important landmarks of the city. Take the midday Shatabdi Express from Chandigarh back to Delhi.